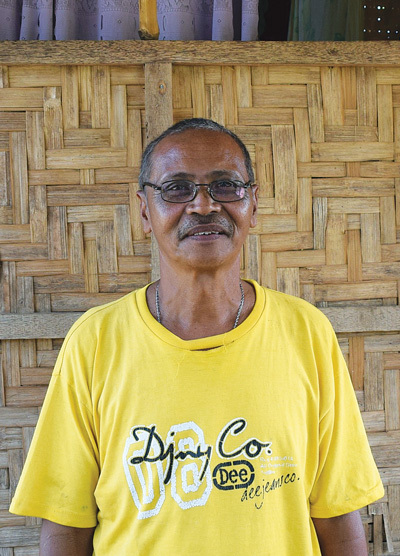 After Typhoon Haiyan, coconut farmers like Artemio Plana saw their means to provide for their families destroyed. 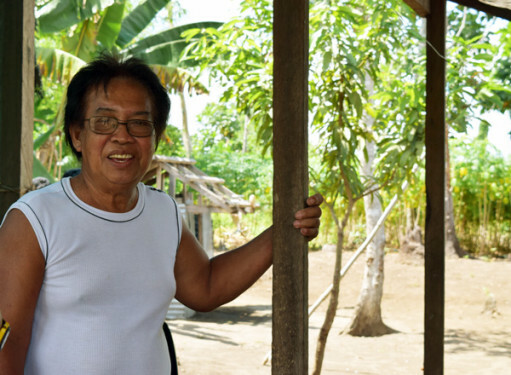 When Super Typhoon Haiyan hit the Philippines on Nov. 8, 2013, coconut farmer Artemio Plana had his livelihood wiped out. 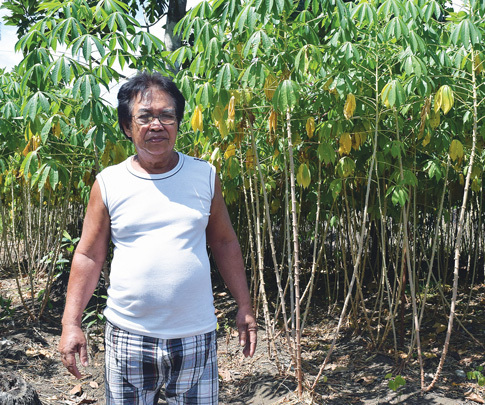 But as the typhoon landed two years ago, Plana – who braced the typhoon with his family in Tolosa, Leyte – was not thinking about his land being destroyed but of the safety of his family. When he and members of the family ventured out of the house, Plana saw debris and fields destroyed. “I think we are the only ones left,” he told his children before other people started roaming around looking for food and water. As aid started coming, he realized that his way of providing for his family was lost. 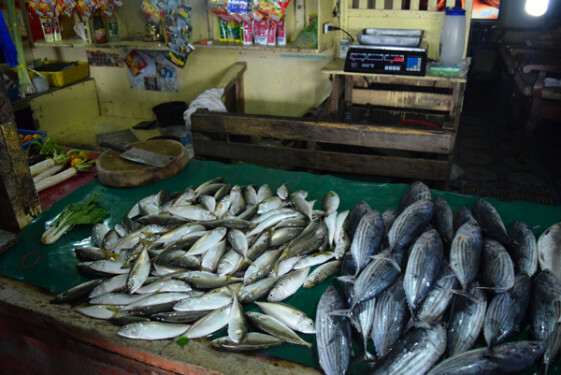 The typhoon – thought to be the strongest tropical cyclone to hit land in recorded history – not only devastated 44 Filipino provinces and claimed more than 6,300 lives, it also destroyed or disrupted the livelihoods of 5.6 million people. Those hardest hit included people who depended on fishing, agriculture or small-scale commerce as their source of income. Many families already had been living below the poverty line. 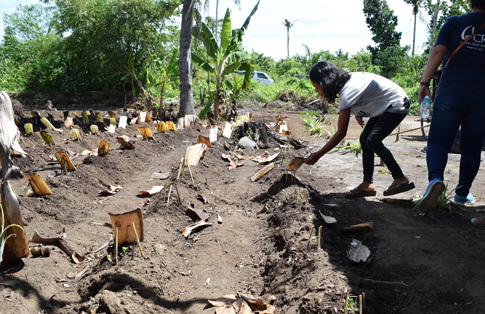 Plana was among 300,000 farmers affected after Haiyan destroyed 33 million coconut trees. Catholic Relief Services (CRS), the international humanitarian agency of the Catholic community in the U.S., and other organizations like Caritas work with those hardest hit in the poorest areas of Leyte and Samar islands. 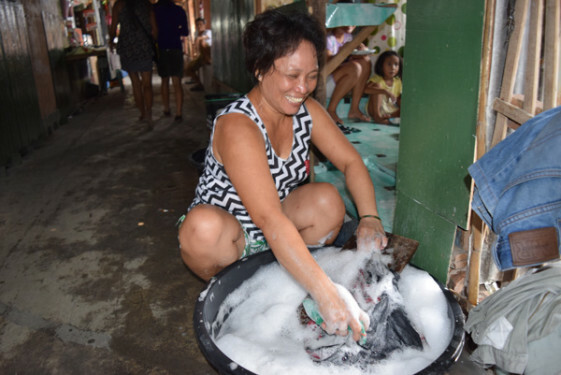 As part of its five-year recovery program in response to Haiyan, CRS is helping thousands of Filipinos get sustainable jobs. CRS provides a menu of options including intercropping, animal husbandry, aquaculture and small business development. Once people have chosen, CRS provides investment capital and vocational training to develop and strengthen the skills they need. Charles Chikwiramadara, program manager of the livelihood and income recovery program, said having options matters. Jose Camenting, who is part of CRS’s intercropping program, hopes to make enough money to send his children to college. Jose Camenting is trying to adapt and plant vegetables resistant to drought during a stronger El Niño season. Plana added that climate changes affect their everyday life. “Before, we did not have so much sun (this time of the year); now we cannot work for more than two hours” at a time, he said. Planting different crops allows him to diversify his income and hopes that little by little he can help all of his children gain a higher education. He has already sent five of his 11 children to college. “They are depending on me,” he said. To date more than 8,650 people have gotten back to work with cash assistance or technical support obtained through Catholic Relief Services. CRS said 48 percent of those employed are women. 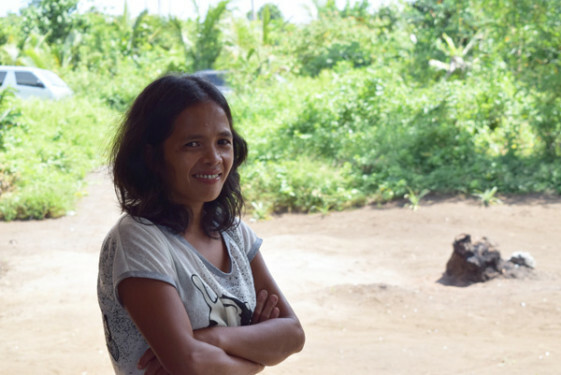 Nady Biay, another beneficiary, said trainings in natural farming helped her support her family of six. Her husband, who used to work as a laborer in a coconut farm, is now a rickshaw driver and makes about 50 pesos (a little over $1) a day. With the intercropping grant, she is able to plant different vegetables for consumption and to sell at the market. The extra income helps them pay for transportation to their children’s schools. 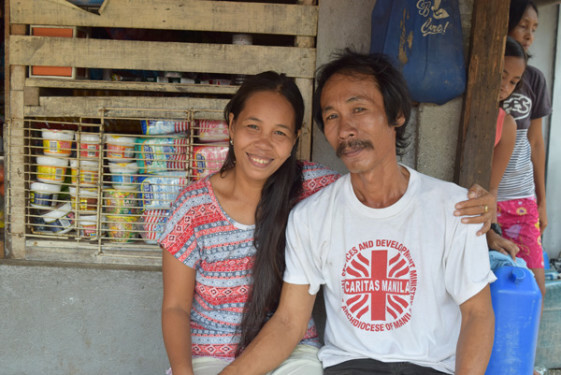 Nady Biay is a farmer who benefited from CRS livelihood training. She also raises native chicken and a pig to support her family. 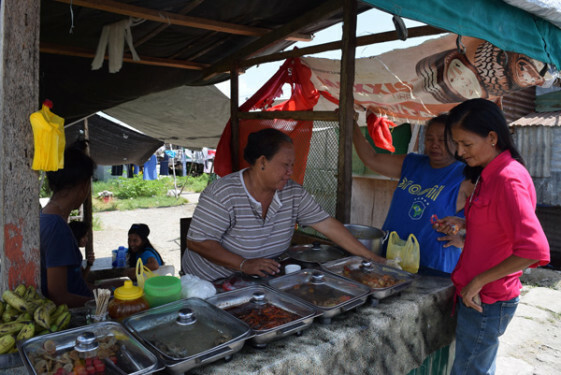 She gradually bought chickens, which she can sell for 100-500 pesos. 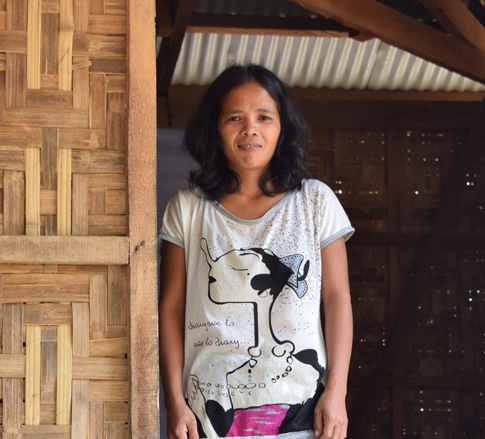 Having different options to sustain their family gives them hope to get back on their feet in the future. CRS’ approach to recovery is implemented through the lens of integral human development, said Joan Rosenhauer, CRS vice president for U.S. operations. As the initial two-year emergency and transitional phase is ending, CRS is moving to the recovery phase, helping families living in dangerous coastal areas to relocate and improve community preparedness to reduce risks in case of future disasters. 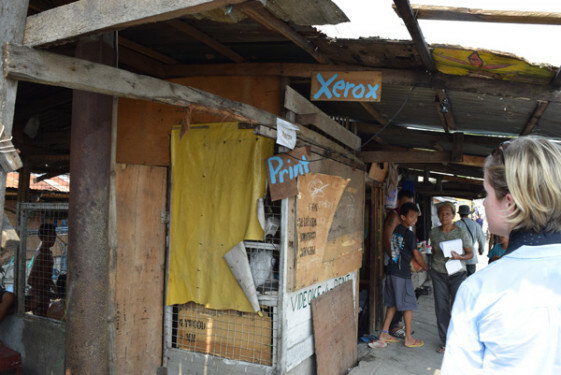 In total, the organization hopes to serve 100,000 households (about 500,000 people) since its efforts began in 2013. The long-term recovery process is made possible thanks to donors and the support of the U.S. church, CRS officials said. As of late March 2014, 148 U.S. dioceses raised $24.5 million in special collections to help Haiyan’s survivors, according to a USCCB press release. “I’m thankful for the help CRS gave to alleviate our situation. I would like to thank all the NGOs for helping us,” Camenting said. 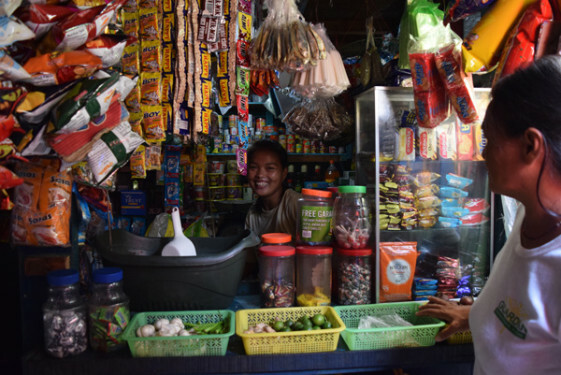 Though they said they are still one-third of the way toward recovery, they are thankful for the emergency response, reconstruction aid and now the support rebuilding their means of securing the necessities of life.